(Nanowerk News) A team at Helmholtz Zentrum Berlin (HZB) has carried out the first detailed study of how magnetic and geometric ordering mutually influence one another in crystalline samples of spinel. To achieve this, the group synthesised a series of mixed crystals with the chemical formula Ni1-xCuxCr2O4 in which the element nickel was successively replaced by copper. They discovered through neutron scattering experiments at BER II not only how the crystal structure changes, but also uncovered new magnetic phases. The results were published in Physical Review B ("Competing Jahn-Teller distortions and ferrimagnetic ordering in the geometrically frustrated system Ni1-xCuxCr2O4"). Spinels consist of densely packed, highly symmetrical planes of oxygen atoms (somewhat like a densely packed box of marbles) where different metallic elements are lodged in the spaces between them. A great many different types of compounds arise as a result that are employed in extractive industries and as heat-resistant and magnetic materials. The embedded metal ions in the Ni1-xCuxCr2O4 spinel system cause a distortion of the crystal structure. In addition, they also display magnetic moments due to the geometrical structure that cannot be oriented as they otherwise would be. As a result, spectacular new temperature-dependent ordering arises. The HZB team has now comprehensively analysed the chromium-spinel system and have explained the complex phase diagram at a fundamental level for the first time. In order to prepare high-purity specimens with exact proportions of nickel and copper, Michael Tovar first had to considerably improve the preparation technique. 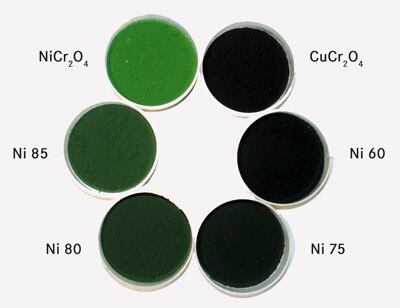 The series begins with samples of pure nickel-chromium spinel (x=0; a green powder) and continues with increasing proportions of copper. This causes the samples to be increasingly dark. With the copper proportion at 100 %, in the end the powder is black. The powders consist of small crystal grains whose diameters are between 30 and 50 microns. The exciting thing about this series of mixed crystals is that nickel or copper atoms sit at what are referred to as tetragonal sites of the crystal structure. Due to their different configurations of electrons, these tetrahedra become elongated along the crystallographic c-axis for nickel, while for copper they are compressed (Jahn-Teller effect). The distortion of the crystal structure can thus be controlled, which in turn has an effect on the magnetic ordering. 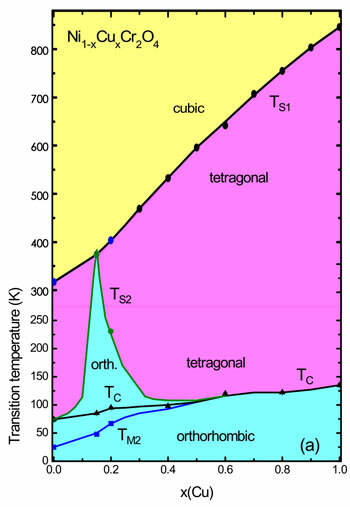 Using neutron scattering experiments at the BER II research reactor, Manfred Reehuis and Michael Tovar were successful in determining the structural and magnetic properties for each of the mixed crystal specimens over quite a wide temperature range, from near the zero point of the Kelvin temperature scale to above 900 K. The two scientists discovered new magnetic ordering and were able for the first time to create a complete phase diagram of the system. This shows that the crystal structure is cubic (three right angles, three equal edges) at high temperatures, since the kinetic energy of the atoms still suppresses the Jahn-Teller effect and magnetic ordering cannot become established. As the temperature declines, the Jahn-Teller effect comes to the fore and causes a reduction of the crystal symmetry initially to tetragonal (three right angles, two equal edges), and finally orthorhombic (three right angles, three unequal edges). What is interesting is that the magnetic phases only occur in the orthorhombic structure, which lies far below room temperature for pure nickel-spinel as well as for copper-spinel. ?We were able for the first time to determine the magnetic characteristics exactly and thereby prove there is a relationship between the conditions for magnetic ordering and the crystal structures. This was a question that physicists have been preoccupied with for more than 50 years?, explains Manfred Reehuis. At a mixture ratio of 85 % nickel and 15 % copper, the spinel system displays a kind of narrow peninsula of orthorhombic state in the phase diagram where the observed relationship of crystal symmetry and magnetism briefly breaks down. Contrary to what has been assumed until now, the cause of this is the distortion of the nickel and copper tetrahedrons at 90? to each other rather than in the same direction. This results not in mutual cancellation of the distortions at this mixing ratio, but instead in a maximal distortion of the structure. ?Atoms are not just spheres. They do crazy things, especially when they are in a geometrical system like a crystal, rather than in isolation?, says Michael Tovar.